Wow. Thank you. Thank you for coming. You seem like a great crowd. I hope you’ll enjoy the show. Oh, wait. This isn’t standup. It’s my blog. Ok then. For my first post, I bestow upon you, my reader, an original recipe. Well, I suppose all recipes are original at some point, but this one is original to moi. I made it up all by myself, with a teensy bit of input (some incorporated, some ignored) from Husband and a couple of friends. So, without further ado, I give you… da da DA! 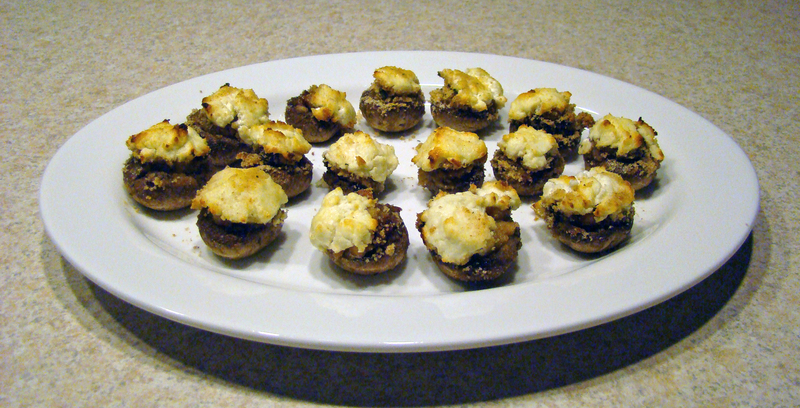 Mushrooms Stuffed With Scallops & Goat Cheese. 20 bay scallops fresh or frozen & thawed (bay scallops are the little ones – think BAYbee scallops vs. the larger sea scallops). Thoroughly wash mushrooms. Pop out and discard stems. Place mushroom caps in a shallow casserole dish. 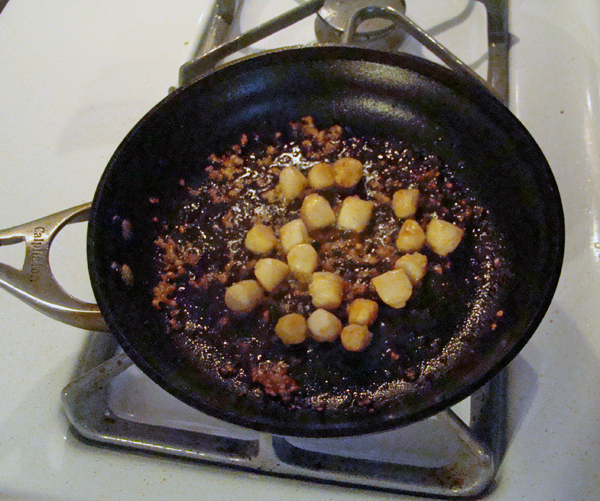 Sautee garlic & scallops (on medium heat) in 1T olive oil, stirring/flipping them frequently). When scallops are cooked through (they’ll be opaque, about 3-5 minutes), remove from pan and dice. Place diced scallops (and toast-dark garlic) in a bowl and combine with breadcrumbs, lemon juice, and remaining olive oil. Press mixture into mushroom caps. 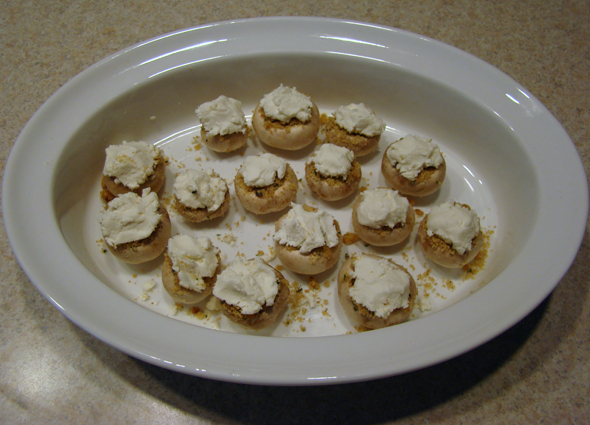 Top each with about ½-¾ tsp of goat cheese. 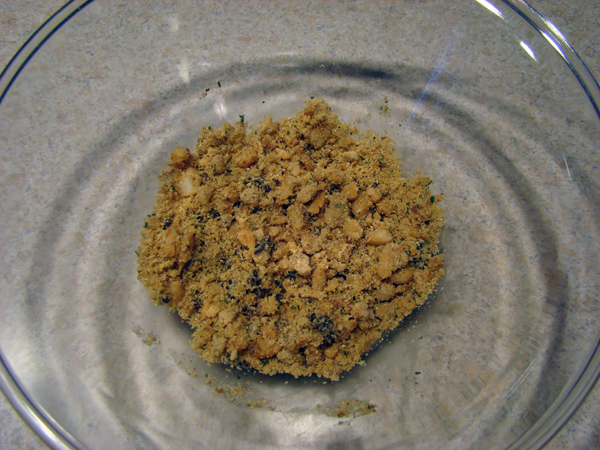 If desired, sprinkle a little bit of extra bread crumbs on top. Always follow proper safe food handling practices with raw seafood. This dish may be prepared ahead of time and stored in the refrigerator (covered so it won’t dry out) for a few hours prior to topping with breadcrumbs (if desired) and baked. I initially made this recipe as an appetizer for the Bears game last Sunday (yes, we sometimes get fancy with our football food in this house). I used the scallops in their whole form, but Husband and I agreed (based on the tweaked recipe) that it’s better when they’re diced. I encourage you to share and tweak this recipe as you see fit. I only ask that if you repost it somewhere that you give credit where credit is due. And so, there you have it folks. My first blog post. I hope you’ve enjoyed it – and that you’ll enjoy the mushrooms even more.